The Act also amends the definition of ‘cheque in the electronic form’. It is defined to mean a cheque drawn in electronic form by using any computer resource and signed in a secure system with digital signature (with or without biometrics signature) and asymmetric crypto system or with electronic signature, as the case may be. (Section 6) Further, the definitions of ‘computer resource’, ‘digital signature’, ‘electronic system’ and ‘asymmetric crypto system’ are amended to be the same as those assigned to them in the Information Technology Act, 2000. The Act replaces the ordinance which was promulgated in October 2015. It provides for creation of Commercial Courts, equivalent to district courts, which may be set up in all States and Union Territories, by the State Governments after consulting with their respective high courts. Setting up of Commercial Divisions has been made possible in those High Courts which exercise ordinary original civil jurisdiction, that is, the High Courts of Delhi, Bombay, Calcutta and Madras. The Commercial Appellate Division is empowered to hear appeals relating to a commercial dispute, filed in a High Court against the orders of Tribunals like the Competition Appellate Tribunal, Debt Recovery Tribunal, Intellectual Property Appellate Tribunal, Company Law Board or the National Company Law Tribunal, Securities Appellate Tribunal, and Telecom Dispute Settlement and Appellate tribunal. The minimum pecuniary jurisdiction of the Commercial Courts and Commercial Division is stipulated as one crore rupees. The Act make provisions to deal with the problem of the Black money that is undisclosed foreign income and assets, the procedure for dealing with such income and assets and to provide for imposition of tax on any undisclosed foreign income and asset held outside India. It functions as an addition to the Prevention of Money Laundering Act, 2002. It applies a flat rate of 30 per cent to undisclosed foreign income or assets of the previous assessment year. (Section 3(1)) No exemption, deduction or set off of any carried forward losses (as provided under the IT Act) would apply. This would apply from April 1, 2016 onwards. It provided for a one-time compliance opportunity to persons who have any undisclosed foreign assets (for all previous assessment years) will be provided for a limited period. Such persons were permitted to file a declaration before a tax authority, and pay a penalty at the rate of 100%. The compliance window was opened from July 1, 2015 to September 30, 2015. Tax at the rate of 30 percent and penalty at the rate of 30 percent is to be paid by December 31, 2015, according to the government statement. The Bill also introduces a provision for registration of a person as an Overseas Citizen of India cardholder under ‘special circumstances’, even if s/he does not satisfy any of the listed qualifications. The Act amends the Motor Vehicles Act, 1988. The Act provides for application of provisions of the Principal Act to e-cart and e-rickshaw. E-kart and e-rickshaws are defined to mean special purpose battery powered vehicles of power not exceeding 4000 watts, having three wheels for carrying goods or passengers, as the case may be, for hire or reward, manufactured, constructed or adapted, equipped and maintained in accordance with such specifications, as may be prescribed in this behalf. It however exempts e-karts and e-rickshaws from Section 7(1) which stipulates that a learner’s license cannot be granted to a person unless s/he has held a driving license to drive a light motor vehicle for at least one year. The Act also updates the name Uttaranchal to Uttarakhand in this list. 9. 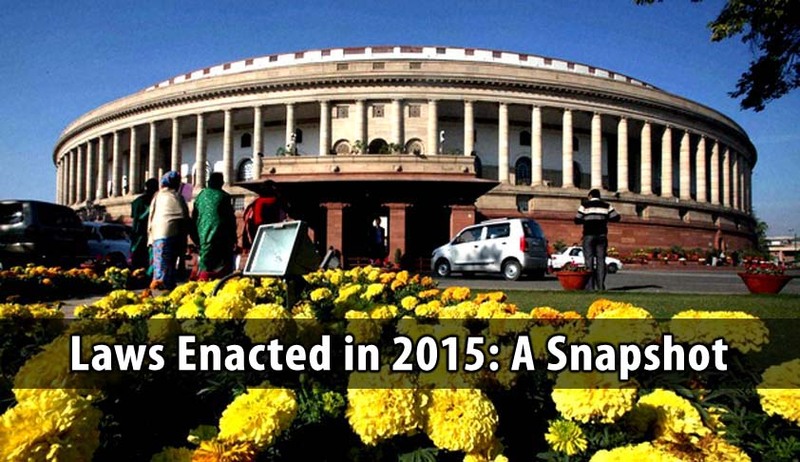 The Insurance Laws (Amendment) Act, 2015. The Act amends the Insurance Act, 1938; the General Insurance Business (Nationalization) Act, 1972; and the Insurance Regulatory and Development Authority Act, 1999. The Act omits Section 25 of the General Insurance Business (Nationalization) Act, 1972 which restrained foreign insurers from issuing insurance policies in India without prior government permission. It provides for the creation of a District Mineral Foundation (DMF) and a National Mineral Exploration Trust (NMET). The DMF is to be established by the state government for the benefit of persons in districts affected by mining related operations. The NMET shall be established by the central government for regional and detailed mine exploration. Licensees and lease holders shall pay the DMF an amount not more than one-third of the royalty prescribed by the central government, and the NMET two percent of royalty. The Act replaced two ordinances issued by the government - the first on October 21, 2014 and the other in December, 2014, after the apex court cancelled the allocation of 214 blocks since 1993. All the 204 mines whose allocation was cancelled by the Supreme Court, are defined in the act as ‘Schedule-I coal mines’. Out of these, the 42 mines which were already producing and ready to produce coal were defined as ‘Schedule-II coal mines’. Other 32 coal mines which are at various stages of development were defined as Schedule-III coal mines. These coal mines are meant for specified end-use and the Central Government has been empowered to move mines from Schedule I to schedule-III. The new Act has provisions for allocation of coal mines through a transparent bidding process i.e. E-auction, in order to ensure the continuity in coal mining operations and promotion of optimum utilization of coal resources. The Act also facilitates E-auction of coal blocks for private companies for captive use and allots mines directly to state and central Public Sector Undertakings (PSUs). It contains provisions that propose strong measures for rehabilitation and compensation for displaced persons. It further enables sale of coal especially to small, medium and cottage industries which will increase employment & incomes in these sectors. The Act amends the Andhra Pradesh Reorganization Act, 2014. The Bill increases the strength for the Legislative Council for Andhra Pradesh to 58 members. In doing so, it increases the number of members to be elected by members of municipalities, district boards and other local authorities to 20 members. The number of members to be elected by members of the State Legislative Assembly has been increased to 20 and to be nominated by the Governor to 8. The Act amends the Regional Rural Banks Act, 1976. It removes the 5 year limit over the responsibility of Regional Rural Banks to provide managerial and financial assistance, thus allowing such assistance to continue beyond this duration. The Act raises the amount of authorized capital of each RRB to INR 2,000 crore and states that it cannot be reduced below Rs one crore. Further, it allows RRBs to raise their capital from sources other than the Central and State Governments, and sponsor banks. In such a case, the combined shareholding of the Central Government and the sponsor bank cannot be less than 51%. Additionally, if the shareholding of the State Government in the RRB is reduced below 15%, the Central Government would have to consult the concerned State Government. The Act amends the Warehousing Corporations Act, 1962. It does away with the Central Government’s responsibility of being a financial guarantor to the central warehousing corporation. Accordingly, provisos to certain sections relating to the government’s responsibility of being a guarantor to the central warehousing corporation are proposed to be omitted. The Act amends the Payment and Settlement Systems Act, 2007, extending its application to a designated trade repository, or issuer, in relation to payment systems. It introduces a new provision for settlement and netting in relation to central counter parties (who is a system provider who by way of novation interposes between system participants). It states that upon an order of declaration of insolvency, dissolution or winding up in relation to a central counter party, the payment obligations and settlement instructions between the central counter party and the system participants are to be determined by the central counter party in accordance with the gross or netting procedure or any other provision of this Act. The Act amends Companies Act, 2013. It removes the requirement of a minimum paid up share capital amount for private and public companies. It introduces a provision stipulating punishment for contraventions for acceptance of deposits from the public. Such a contravention would now entail a minimum fine of Rs one crore and a maximum of Rs 10 crore, in addition to the deposit or interest that is due; and up to seven years imprisonment and fine between Rs 25 lakh to Rs two crore, or both, for every defaulting officer of the company. If proved that the defaulting officer of the company did so willfully, he will be liable for the offence of fraud, under this Act. The Act limits the constitution of benches of Special Courts only for the trial of offences where punishment is imprisonment of two years or more. All other offences are to be tried by a metropolitan or first class judicial magistrate. Further, doing away with the requirement of a special resolution with regard to related party transactions, the Act states that a resolution would not be necessary for transactions between a holding company and its wholly owned subsidiary whose accounts are consolidated with such holding company and have been placed before the shareholders for their approval. The Act amends the Constitution of India to give effect to the acquiring of territories by India and transfer of certain territories to Bangladesh in pursuance of the agreement and its protocol entered into between the Governments of India and Bangladesh. The Act amends the Delhi High Court Act, 1996. The Bill increases the pecuniary jurisdiction of the High Court of Delhi to INR 2 crore. Consequently, the Bill empowers the Chief Justice of the Delhi High Court to transfer any pending suit to a relevant subordinate court.